For every job, there is a tool. And using the correct tools can make all the difference in the world. Using the wrong tools can cause delays, unsatisfactory work, and physical danger to the user and others in the area. If you have a project or job that requires screws or fasteners to be tightened to a specific torque, then a torque screwdriver is the right tool for you. Whether it’s a small job that requires delicate precision, or a bigger job that needs a certain amount of power, torque screwdrivers come in a wide variety of shapes and sizes ensuring that you find the right one for your task. Torque screwdrivers are basically screwdrivers that were designed to tighten screws and fastener up to a certain torque in order to prevent damage while at the same time ensuring enough security to prevent the screw from becoming loose. If a screw is tightened too tight, it can cause damage and break off, and if it is too loose, the screw could come out. Torque screwdrivers allow the user to set the torque at a specific value, and they feature a clutch that disengages once you’ve surpassed this value to prevent over tightening. A screwdriver is a must-have item for every household and garage, and although you might be tempted to grab the nicest looking torque screwdriver you see, keep in mind that not all torque screwdrivers are created equal. You want to keep in mind exactly what you will be using it for so you can choose a tool that can be used safely and is best suited for that job. If you are not sure what kind of torque screwdriver you need, don’t worry, that what we’re here for. We’ve reviewed some of the best torque screwdrivers on the market and compiled a list of tools that can take on small and big jobs alike! Our list not consists of the best brands on the market, but we’ve listen their best features, torque ranges and what kind of job they would best be suited for. This high-quality torque screwdriver from Capri Tools is the ultimate tool when it comes to superb precision control and amazing accuracy. To ensure that you get the perfect torque setting, this tool comes with a calibration certificate that is internationally recognized. It has an accuracy of +/- percent and is individually calibrated according to ISO 6789 and ASME B107.300 standards. When working on a delicate project, every inch-pound of torque counts. Too much can cause damage to your screw. For the ultimate in precision, you can adjust the torque settings by 1-inch increments and the tool automatically locks with each adjustment. Leverage and position are very important when using a screwdriver. Capri Tools designed this to be comfortable to use while giving you the power you need. It even comes with a T bar attachment for extra leverage. Capri Tools created an ergonomic tool that is precise, safe, and easy to use. The set also includes 20 screwdriver bits, a T bar, and a sturdy plastic storage case to keep everything together. Sometimes, a job needs a delicate touch, and having the right tool can make all the difference in the world. 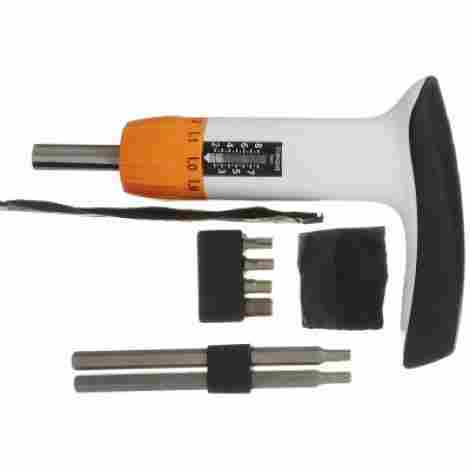 The Adjustable Micro-Torque Screwdriver was designed for tasks that involve smaller parts, such as instrument assembly projects and working with electronics. As our vehicles contain more and more electronic parts, it's vital that we are ready to deal with whatever issues may arise. It is compatible with all standard quarter-inch bits and has a torque range of 3 to 15 inch-pounds. Setting the torque to the proper setting is important in preventing over-tightening and causing possible damage. This adjustable model allows you to accurately change the torque with a specially designed adjusting knob and features a window scale that is easy to read. Stability is vital when trying to tighten or loosen a screw. If your bit keeps slipping, then you can accidentally damage the component. The quarter-inch hex bit holder features strong earth magnets that keep your bit secure and stable. If you work a lot with the electronic components of your vehicle or have a job that requires working with smaller parts, this micro-torque screwdriver is perfect for you. It can be adjusted in 1-inch pound increments and is compact enough to work in tight spots. This torque screwdriver from Neiko features a long shank that allows you to reach some of those harder to reach areas and a rubberized handle for easy and comfortable handling. 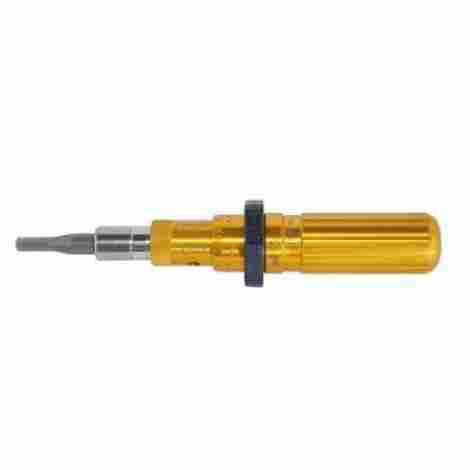 The quarter-inch drive head is designed to be compatible with all quarter-inch sockets, enabling you to use this screwdriver for a wide variety of different jobs. It also includes 20 bits and a strong plastic case for convenient storage. As one of the best-rated torque screwdrivers on the list, you can be sure you a getting a high-quality item. This strong and durable tool has a torque range from 10 to 50 inch-pound and features a meter window display. The quarter-inch head allows you to use different types of sockets ensuring that you always have the right tool. You can switch the torque by pulling the bottom knob out, twist to the preferred setting, and then push the knob back in to lock the torque. This professional-grade torque screwdriver is built to last and comes with everything you need and I considered the best value on this list. The set includes a storage case and 20 different bits such as Phillips, hex, and slotted. 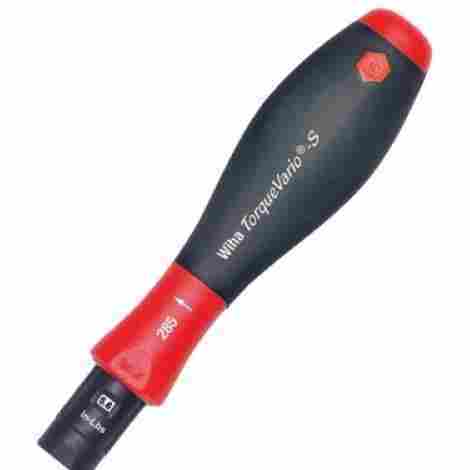 Wiha created the TorqueVario-S screwdriver durable and accurate. The enclosed mechanism makes this an ideal tool in professional settings such as production and repair. Each tool includes a calibration certificate and meets EN ISO 6789, ASME B107.14m, and BS EN 26790 standards. It features a built-in reading window scale that shows you the correct torque value and can only be adjusted with the provided tool in order to avoid unwanted torque changes. With some torque screwdrivers, it may be difficult to know if the tool is locked on the proper torque setting. Wiha takes the guessing game out and employs an audible click every time the torque setting is changed and locked in. As a company that takes pride in their work and products, Wiha gave each torque screwdriver a unique serial number that not only allows the tools to be traced to the manufacturer, but to the certificate of calibration as well. This adjustable torque screwdriver comes in the mid-price range compared to the other tools on the list but has all the high-quality features found on the more expensive models. This includes calibration certificate and a one-year guarantee. This high torque ratcheting screwdriver features a short, compact design that makes it ideal for working in tight spaces. It comes with seven interchangeable tips that allow you to take on a diverse set of tasks without needing to switch tools. A strong magnetic tip is intended to safely hold all the bits in place while working in order to prevent slips that can cause damage and possible harm to the user. Being able to work comfortably is vital for getting the job done correctly an in a timely manner. 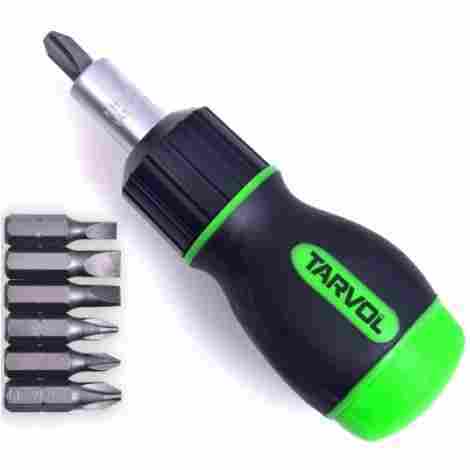 Tarvol built this screwdriver with a soft rubber handle that is convenient and slip-resistant for extra safety. Whether you have a screw that needs to be tightened or loosened, you can set this screwdriver to three different settings; clockwise, counter-clockwise, and lock. This allows the user to always take full advantage of its high torque. This is the lowest costing screwdriver on the list, but that doesn't mean you're m=not getting a great product. Not only do you get seven interchangeable tips included, but it also comes with a lifetime guarantee. Whether you're looking for the perfect Father's Day gift or just need a versatile tool that can help you around the house, Stkusa's adjustable torque screwdriver can fulfill these needs. You get fourteen screwdriver accessories that include flat head, Philips, and hex bits, and a compact, durable case to hold and store your tool. The long shank on this adjustable torque screwdriver allows you to reach those hard reach spots where your hand just cannot fit. It also fits any ¼-inch drive sockets, making this your go-to tool for almost any job. This conveniently designed grip handle does more than just reduce hand fatigue, is also features a torque meter window that can easily be read and adjusted. Now you can work even longer and more efficiently. With fourteen different bits includes, you can now take care of all your fastening needs with just one tool. This includes 4 types of Philips, 2 types of slotted, 6 types of torx, and 4 types of hex bits. 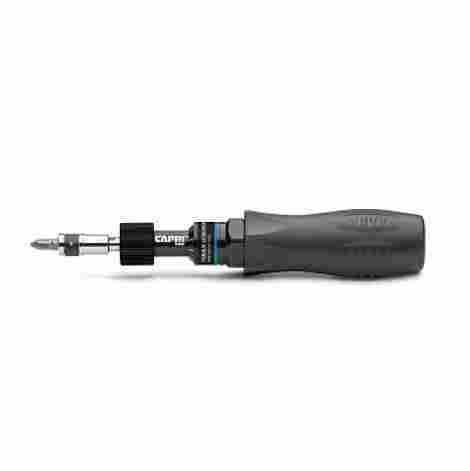 This easy to use torque screwdriver from Wera features a specially created handle for safety, comfort, and durability and a quick-release chuck that lets the user quickly switch bits with one hand. You don't need any special tools to adjust the torque level, which has an accuracy of plus or minus six percent and includes a calibration certificate. Wera created a uniquely designed handle that helps reduce stress and fatigue while working, making this the ideal tool for professionals and DIY enthusiasts alike. It also allows you adjust the torque without the need of any extra special tools. This torque screwdriver not only meets all the ESD safe products required specifications but exceeds them while protecting against static electricity and other related damages. The Kraftform torque screwdriver is a sturdy state-of-the-art tool with features that make it stand out above the rest. It's built for high-speed torque transfer and comes with a limited lifetime warranty. Tohnichi America has been making high-quality torque tools, accessories and specialty tools since 1984 and has expanded to markets all around the world. 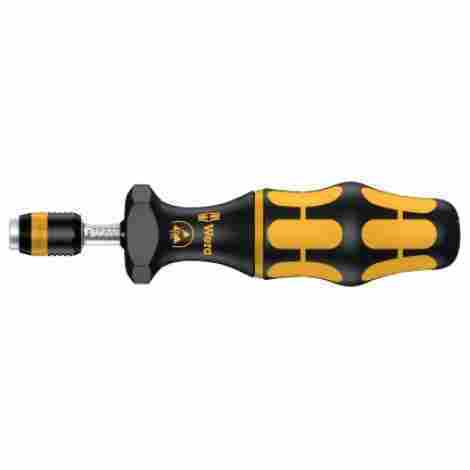 Their adjustable torque screwdriver has one of the most accurate torque settings on the market. It comes with special features that prevent over torque and alerts the user when a torque setting is properly achieved. It's vital the torque setting doesn't change while working in order to prevent damage to the screw. This torque screwdriver features a lock ring that ensures the selected torque setting stays in place and click whenever the torque setting is achieved. When working with fragile parts and screws, too much torque can easily cause irreparable damage. Tohnichi's screwdriver comes with a certificate of calibration and has an accuracy of plus or minus three percent. It also features a rotary slip mechanism that causes the screwdriver to ratchet after achieving the set torque. This is one of the more expensive models on the list, but its accuracy is unbeatable. It is compatible with all ¼-inch hex bits and is built with high-quality material that will ensure many years of work. 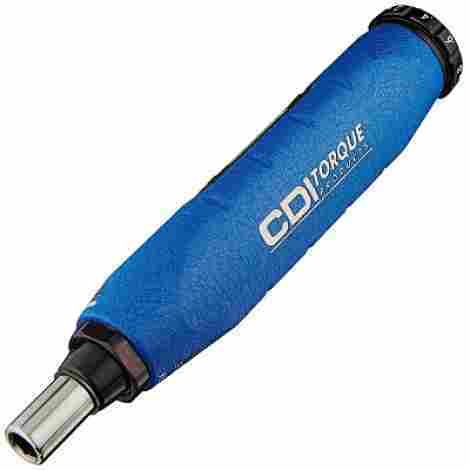 As one of the world's biggest suppliers of high-quality industrial torque tools, CDI Torque Products is known as a leader in precision torque, tension and force calibration system. The TorqControl screwdriver comes with some amazing features that back up the company's respected reputation. Some of these features include torque limiting clutch, specially designed handle and a quarter inch magnetic hex bit shank. When working with low-torque screws, complete control of the screwdriver is a must. The ergonomically designed handle comes in an L-shape that is comfortable and easy to manage. Improperly tightening a screw can cause a lot of problems, such as poor performance and joint failure. TorqControl comes with a limiting cam-over clutch that is designed that eliminates the possibility of applying too much torque. This torque screwdriver was produced by one of the top brands in the torque tool industry and comes with six hex bits, including two long bits for hard to reach spots. Every tool goes through quality control with the results written on the packaging. If you frequently work with high precision electronic products and need a torque screwdriver that is small and delicate, yet powerful enough to handle assembling and disassembling, then this is the perfect tool for you. Anee's rechargeable electric torque screwdriver comes with six bits, built-in device for torque adjustment, and a clutch that keeps you from damaging the screw. When you have a project to do, there is nothing more annoying than having to take a break so your tools can recharge. This screwdriver comes with a 300mAh3.7 V battery that charges in less than an hour can be used for 5 hours straight, and retains power for 200 days. Ansee tests every part that goes into the electronic torque screwdriver to ensure high precision and accurate torque. The torque can be adjusted from 0.01N.m to 0.1N.m and has a speed of 250rpm. 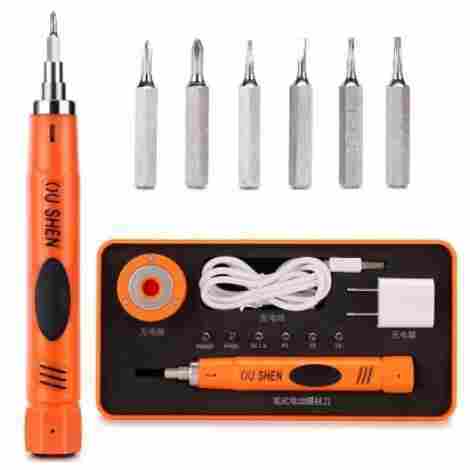 This high precision electronic torque screwdriver comes with six common bits, a rechargeable stand, USB Power adaptor and cable, and a storage case. It's also made with stainless steel parts that are rust proof and anti-corrosion. Although the torque screwdrivers on our list are all great and come with their own unique features, you may want to fight the temptation of buying the first tool you like. Keep in mind that not all torque screwdrivers were built the same and you’ll need to consider what type of work you’ll be using it for. Some jobs require high torque, while others require a very small amount of torque. In order to ensure efficiency and safety, you’ll not only need a good quality tool, but one that is specifically designed for the type of work you do. 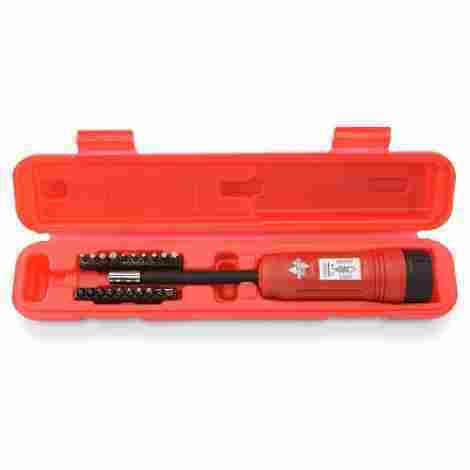 Manual Torque Screwdriver – Manual torque screwdrivers are powered by the user’s own brute force. Similar to basic manual screwdrivers, these are operated manually by the twisting the handle with your wrist either clockwise to tighten, or counter-clockwise to loosen. They come in two different styles, pistol-grip and straight models and are ideal for smaller and medium sized jobs with a torque range of 0.04 Nm to 20 Nm. Although you will find these types of screwdrivers in manufacturing environments, they’re not ideal for high volume work as this can cause repetitive operation injury. 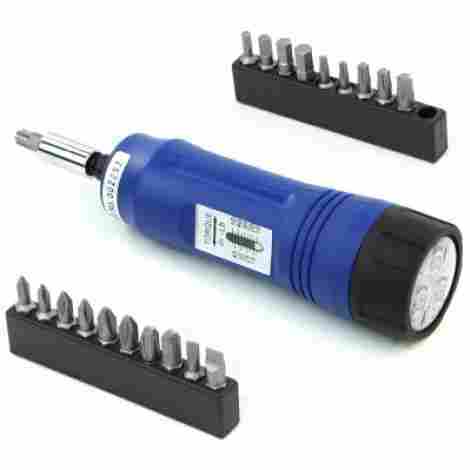 This type of torque screwdriver can be powered either by batteries or a plug-in power source and come in three different styles; angle, inline, and pistol grip. You will usually find electric screwdrivers in industrial environments and is commonly used for small parts assembly and electronic assembly. They can have either brushed electric motors or brush-less motors and have a wider range of torque than manual torque screwdrivers and can vary from 0.01 Nm to 27 Nm. These are not only great for light assembly projects, but also for high volume work. Pneumatic Torque Screwdriver – These types of torque screwdrivers are ideal for bigger jobs that require a high level of torque. Pneumatic torque screwdrivers get their power from a pressurized air force and are commonly used in marine, aerospace, and automotive industries. They have a torque range that can go up to 30Nm, but are not as accurate as electronic or manual torque screwdrivers. These are very reliable tools and perfect for projects that require high cycle rates and faster speeds. Range is important when choosing the right torque screwdriver. Some jobs require a much higher torque to ensure that the screw is properly fastened while other jobs require a very low torque to prevent damage to the screw. The amount of torque a screwdriver can exert can ranges from 0.01Nm (1.4 inch ounce) to 30Nm (265 inch pounds), but no one tool can cover this entire range. You will find that torque screwdrivers will have either a low, mid, or high torque range. When deciding what type of torque screwdriver you will purchase, keep in mind the type of work that you plan on doing with it and how much torque this will require. Whenever you work with tools, it is important that you are comfortable. Otherwise, fatigue can set in and that is when mistakes and accidents most often happen. Torque screwdrivers with soft-textured handles are easier on the hand and can help prevent slips or mistakes that can lead to an injury or damage. Weight, balance, shape and material also play a role in comfort. Ergonomics is especially important if you are a professional who works with tools all day. Unnecessary stress on your body can have long term damaging effects. The chuck is the part of the torque screwdriver where a bit is attached. For the most part, the size of the chuck is relative to the size of the screwdriver. If you need a screwdriver that can be versatile, then you’ll want one that features a chuck in a common size, such as ¼ inch hex, which enables you to use any ¼ inch bit. Preset torque screwdrivers feature internal adjustment mechanisms that need to be preset with a specific tool, usually a hex key, before use. When the torque value is achieved, the tool will send a signal to the user. Although it is more difficult, you can reset the torque value if needed with a torque analyzer. Unlike preset torque screwdrivers, adjustable torque screwdrivers have a built-in external adjustment scales which allow the user to easily and accurately set the proper torque with a micrometer torque adjustment mechanism. These are not always as accurate as preset torque screwdrivers, but a good quality tool will come with a bezel device or ring that locks in the torque setting in order to prevent unwanted torque changes. Cam Over – This type of clutch is normally found on manual torque screwdrivers and cams over, or clicks, to let the user know that the desired torque has been achieved. Auto Shutoff Clutch – Found on electronic torque screwdrivers, this type of clutch is ideal for high precision jobs. Once your screwdriver has reached the maximum torque, the auto shutoff clutch will switch your tool off, which not only prevents damage, but also reduces energy consumption. While it’s normal for tools to become damaged, break, or corrode over time, having a high-quality tool will not only will not only reduce these issues, but they are also safer to use. Torque screwdrivers can be costly, so buying from a reputable brand that guarantees the durability of the tool is always a good idea. You also want to keep in mind how much you will be using this tool. If you are a professional who needs a tool that can resist corrosion and handle the everyday wear and tear, then spending a little more money for better quality is a good idea. If you just need something for the occasional DIY project or some simple home maintenance, then something simple like a manual torque screwdriver should do. If you have an important task that requires a certain amount of torque to be used, then you want to make sure that your torque screwdriver is properly calibrated. Too little torque can cause loosening and too much torque can cause damage. To ensure that your torque screwdriver is as accurate as can be, get one that comes with a calibration certificate. This certificate means your tool has been tested and can be traced to the National Institute of Standards and Technology or the National Measurement Institute and is considered to be in compliance with ISO/IEC 17025:2005 requirements. Q: What is the difference between your standard screwdriver and a torque screwdriver? A: Your standard screwdriver has a simple design that includes a handle and a shaft and a tip that can come in a variety of different styles. This is powered by the user’s brute force and is only limited by the amount of force you can apply to it. A torque screwdriver can be either, manual, pneumatic, or electric, and features a clutch that can be set to a specific amount of force. Depending on the model, when the set torque is reached, the screwdriver will either click to alert the user, spin in place without screwing any tighter, or shut off. This allows the user to set a specific torque in order to prevent over-tightening or damage. Q: What is a calibration certificate and do I need one with my torque screwdriver? A: A calibration certificate is a document that has testing information about your tool and certifies its accuracy. The testing is done by the National Measurement Institute or the National Institute of Standards and Technology. You don’t necessarily need a certificate. However, if you’re looking for precision and accuracy, a calibration certificate is a good idea. Q: How do I know if my torque screwdriver needs to be calibrated, and how often does it need to be done? A: Sometimes it is difficult to know if your torque screwdriver is not properly calibrated and no longer meets the standards set by the National Institute of Standards and Technology. Other times you will notice that the screws are either too lose or too tight or you maybe your driver head is wearing abnormally. These are good signs that you need to calibrate your torque screwdriver. You should calibrate your torque screwdriver every 12 months or 5000 cycles, depending on how often you use your tool. Q: How do I change the torque setting on my preset torque screwdriver? Connect the torque screwdriver to a torque analyzer and check the current torque setting by turning clockwise until you’ve reached the maximum torque and the screwdriver clicks. Remove the end cap from the handle. Loosen the lock screw and use a hex key (or other tool if required) to turn the internal adjuster. If you are trying to increase torque, turn clockwise. If you are trying to lower the torque setting, turn counter-clockwise. Make sure you don’t go over or below the screwdriver’s recommended torque range. Once you’ve reached your desired torque setting, tighten the lock screw. Record the torque readings, put on a calibration label and replace the end cap. Q: What is a torque tester? A: A torque tester is exactly what the name suggests it is; a quality control tool that used to calibrate and test torque controlled tools. Many of today’s modern torque tester can measure in both, clockwise and counter-clockwise direction. They also have the ability to read and convert the torque power into eight different engineering units: Nm, cNm, in-oz, in-lb, ft-lb, kgf-cm, gf-cm, and kgf-fm. If you plan on purchasing a torque tester, make sure that it has a certificate from the National Institute of Standards and Technology or the National Measurement Institute. Q: My torque screwdriver’s external adjustment scale measures torque in Nm. What does that stand for and how can I convert that to feet – pounds? A: Nm is short for newton meter and represents a unit of torque, also known as ‘moment’, in the International System of Units system. Every newton meter is equivalent to the torque that comes from a force that is equal to one newton being applied horizontally to the end of a one meter long moment arm. If you need to convert Nm to feet-pound, you can easily find a conversion chart online. But if you don’t have access to the internet, just remember that 1Nm is equal to 0.74 feet-pound.